Roll sack down (you’ll roll up / add dirt as plants grow). This is easiest with two people as the sack can be resistant depending on material. The sack should look like a thin doughnut. Add 3 inches of soil—enough to totally cover the bottom. This should be regular garden soil—nothing too rich. Potatoes dislike fresh compost or manure. Place three regular-size seed potatoes or four small (like bintjes or french fingerlings) equidistant apart. Not too close to the edges, not too far away. Barely cover with soil and water lightly. Place sack anywhere that has enough sunlight. 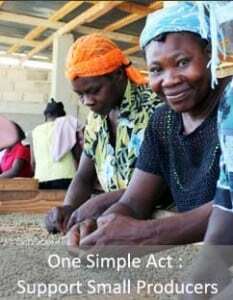 Burlap/jute/sisal is biodegradable. It will rot out on the bottom after a while. Position your bags where you want them from the beginning to avoid sack the ripper! Important: Do not continue to add potatoes. The one layer on the bottom is all you need. Regular potatoes need a couple of feet between rows—they’ll produce lots that way. You can add soil as they grow. The potatoes will begin to sprout after a while. Now, keep adding a bit of soil, barely covering leaves, and water lightly. Expect slow growth at first, especially if spring is cold. After 100 days of growth, leaves will begin to yellow and the potatoes will be ‘done’. 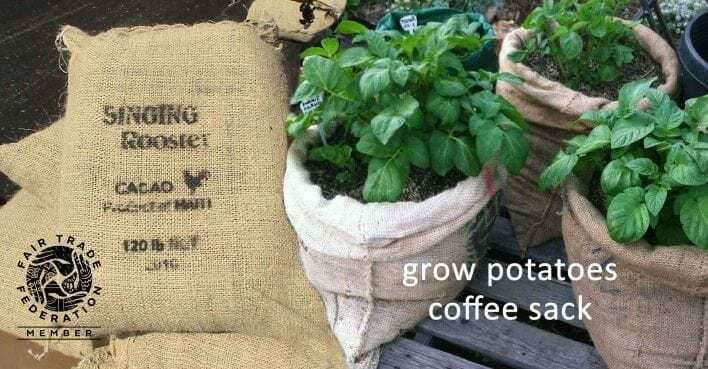 Stop watering them when the sack is full and the leaves start to die off. 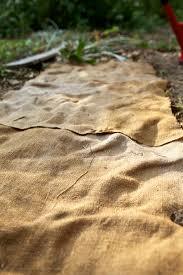 ~ Control weeds by laying sacks directly on top of soil around or in-between plants. They’re heavy & don’t blow around – but can be weighted with stones. If it’s a particularly troubled area, add layers of newspaper underneath. ~ Bee keepers love jute. They burn the material to produce a long-lasting and mesmerizing smoke to calm bees. ~ Red wigglers like living around jute and will actually break sacks down. Use it in your worm bins – shredded for efficiency. Use a strip of it over bedding to prevent fruit flies. ~ In the shed, store dry materials in the sacks — they can last for years. ~ Dogs like to lay on jute (sisal may be too scratchy). *if you’re a garden store or nursery near our roastery in Red Wing MN, we sell our old sacks for $2 a piece. Retail for $4-$5. We’ll drop off for free if you order 50 or more (limited metro area route — let us know you’re interested).